This issue of the AFS Janus epitomizes the very name of our publication: Janus, the ancient Roman god of beginnings and transitions. Janus is typically portrayed looking both backward to the past and forward to the future, as shown on our cover. 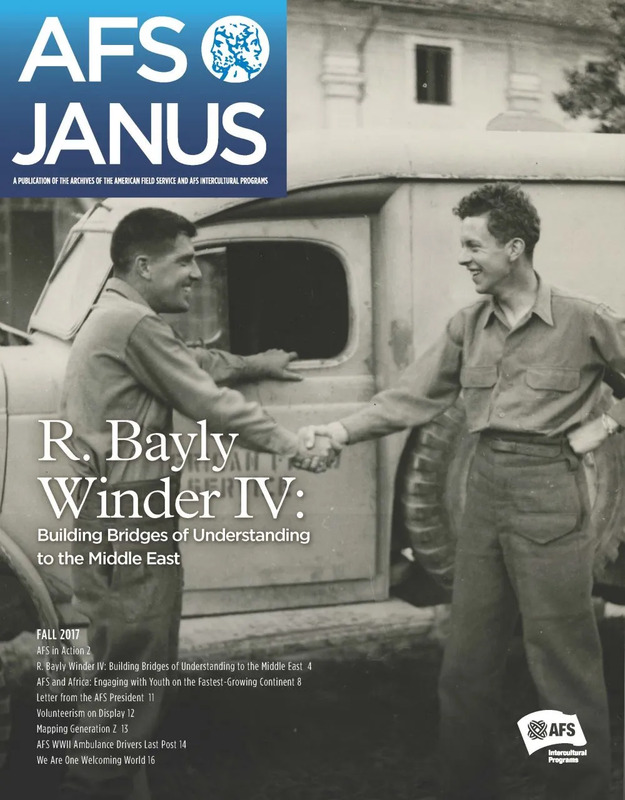 While named for a mythical figure, the AFS Janus shares stories of the real impact of an organization that builds on its legacy to move into the future. In this issue, we are pleased to feature R. Bayly Winder IV, an AFS World War II volunteer who exemplifies this very idea. Inspired by his wartime service with AFS, Winder devoted his life to disseminating knowledge about Arabic and the Middle East. We are able to share his fascinating story and incredible contribution to the public understanding of this region thanks to the assistance of his son, B. Philip Winder. In addition, as AFS prepares for the 50th anniversary of its activities in Ghana, we find overselves reflecting on our longstanding ties to Africa. AFS colleagues Terry Little and Milena Miladinovic examine and report on our historic and current impact there. Later in the issue, we share some information on the state of student exchange programs, based on a groundbreaking AFS study title Mapping Generation Z. AFS President and CEO Daniel Obst specifically addresses how AFS plans to grapple with inqualities in order to ensure that all young people can have an opportunity to engage in the kind of intercultural experiences AFS offers.